And so here is the first review of the year and aptly it is for the first book read in 2013, even if I have got a small backlog of books to tell you about from last year. I have mentioned before that I am very superstitious about the first book of the year as it seems to me it will reflect, or predict, the reading experience that I will have in the year ahead. Odd I know, yet true. Aptly I have whim (my main reading resolution of 2013) to thank for my first read being F.M. Mayor’s ‘The Third Miss Symons’ as I had started a few books and not been quite taken with any of them. However on a trip to Shrewsbury last week I spotted this in the Oxfam bookshop, bought it and then spent a few hours in a cafe not long after, while waiting for The Beard to finish a meeting, reading it from cover to cover – before you think I am some super reader it is only 144 pages of rather large print. Henrietta, or Etta, Symons is the ‘Third Miss Symons’ of the title and this book is really the tale of her life. As the third daughter, and fifth child, of seven she becomes the ‘middle child’, true at a yojng age she does have her time as everyone’s favourite, yet from then onwards she becomes a rather plain and unremarkable woman and we see how this unintentionally effects the rest of her life and her circumstances. It is also F.M. Mayors way of talking about a large amount of women who found themselves in a very similar situation at the end of the Victorian era leading into the suffragette movement. A group of women who seemed to somehow be out of kilter with the world though for no fault of their own, even if it might have made them bitter towards the ends of their lives. We still know some people like this I am sure, as youngsters I am sure we were all aware of a ‘local witch’ or ‘crazy cat lady’ somewhere down the road or in the area that we lived. Did we ever try and understand them? No, yet here in ‘The Third Miss Symons’ Flora MacDonald Mayor tries to do just that and explain it all in the life of Henrietta. It is not the easiest of reads in part because Henrietta is going to be a victim of circumstance, you pretty much know this from the start, and also because she is never really that likeable mainly as the product of her situation. Often there is a tone to the novel which is rather melancholy, which made me wonder if was the reason for the fact it verges on a novella in terms of length. I should add here that I didn’t find the book depressing in itself, more the society of the time and how it treated women who did end up as spinsters and how this even reflected the way a family might choose to interact with one in their own midst. I make single women sound like lepers here but in some ways that is how families seemed to feel about them, unless of course they could be good for money or should the lady of the house day and a replacement be needed or someone to use for their own gains or motives as they got older, otherwise they were really seen rather as a burden. 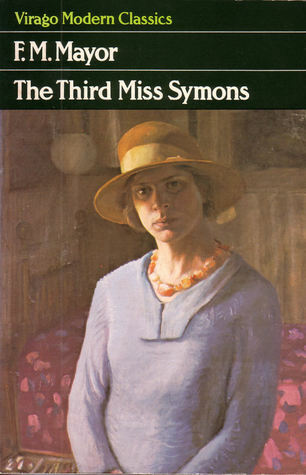 I found ‘The Third Miss Symons’ an utterly fascinating and rather different read. Partly this was because of the insight into that period of British history and how women were treated, or ill treated, in that time and partly because of the character of Henrietta which Mayor has created. I am hard pushed to think of another female character I have encountered quite like her. I was thinking of Harriet in ‘Gillespie and I’, Mrs Danvers in ‘Rebecca’ or Miss Havisham in ‘Great Expectations’ yet Harriet is not as unreliable, bitter, warped or feisty as any of them she is ordinary, yet that is what makes her tale all the more extraordinary. It’s an unusual perspective and an unusual read yet brilliantly so. I was also impressed with how Mayor wrote a whole life, and its ups and downs, in such a short book. If my reading year is to be filled with quirky, unusual and such vividly character filled and prose lead as this book then I am in for a very good reading year. This shows the joys of whim reading, and turning to more golden oldies, instantly doesn’t it? I hope that the rest of my reading year carries on like this. Anyway, who else has read this book and what did you think? I know Susan Hill loves it as she wrote the introduction in my Virago edition, she is also a huge fan of F.M. Mayors ‘The Rectors Daughter’ which is somewhere in my TBR, have any of you read that one at all and if so what did you think of it?